It’s a tumultuous era in U.S. history, particularly in the political realm. A major national candidate regularly uses awful rhetoric on race and class yet has risen to prominence. The frightening emphasis on restoring “law and order” is familiar. There’s a reason politicians still use fearmongering; it often works. It’s good to remember that history goes in cycles, and our current experience is part of a much longer trend going back hundreds of years. A powerful new reminder comes from Ava DuVernay’s documentary 13th. Released on Netflix this past Friday, its focus is the growth of mass incarceration particularly with African-Americans. However, it also presents a larger story of slavery and discrimination that’s alive and well today. DuVernay is known as a dramatic filmmaker, particularly for the widely heralded Selma in 2014. Her directing career actually began with documentaries like This is the Life, though. She’s a natural story teller and recognizes why context is so important when presenting complex issues. It’s easy to look at the prison statistics and realize we have a serious problem. Taking the time to show the history is what separates 13th from a typical documentary. After introducing stunning numbers (U.S. has 5% of world’s population, 25% of its prisoners), DuVernay looks backwards to slavery and the economic conditions that made it essential to the South. Approaching the subject as more than just a moral issue shows the roots that still have an impact today. This material is engaging because of so many smart and compelling participants. A wide range of academics, activists, and politicians come together well to explain the topic. It’s important to learn the cultural context of D.W. Griffith’s Birth of a Nation and why it resonated with so many. Writer/Educator Jelani Cobb and others explain how the terrible representations of African-Americans connected. Even Woodrow Wilson held a screening! Arriving more than 50 years after the slavery ended officially, the controversial film exemplifies the continuation of a familiar narrative. The structure mostly flows chronologically and reveals the stunning rise in the prison population over recent decades. DuVernay effectively uses hip-hop songs to bridge the eras. Displaying the lyrics on the screen in large letters energetically reinforces the message. We learn the real purpose of the “War on Drugs”, particularly during its escalation under Ronald Reagan. An audio clip from political consultant Lee Atwater clarifies that people of color were the target. I already knew some details about the goals of this “war”, but it’s still chilling to hear them. Republicans weren’t the only perpetrators, however. The negative impact of policies passed when Bill Clinton was president (particularly the 1994 crime bill) receives attention. It’s nice to at least see him express regrets, but it’s a little late now. Looking much worse is Donald Trump in a series of video clips from his rallies. DuVernay skillfully cuts between Trump’s coded statements and atrocities under Jim Crow. It reminds us of the stakes of the current election; the next stage could be even worse. The most surprising parts to me focus on the prison industrial complex and the influence of ALEC (American Legislative Exchange Council). I knew little about this law-making organization and its corporate partners. What makes these revelations so distressing is the shift to prisons as profit-making enterprises. If you thought the latest season of Orange is the New Black was far-fetched, think again. The least convincing person in this entire film is the ALEC representative. He can barely look at the camera while trying to defend their moves. The shots of over-crowded prisons and stories of awful conditions strike home on the overhaul that’s needed. 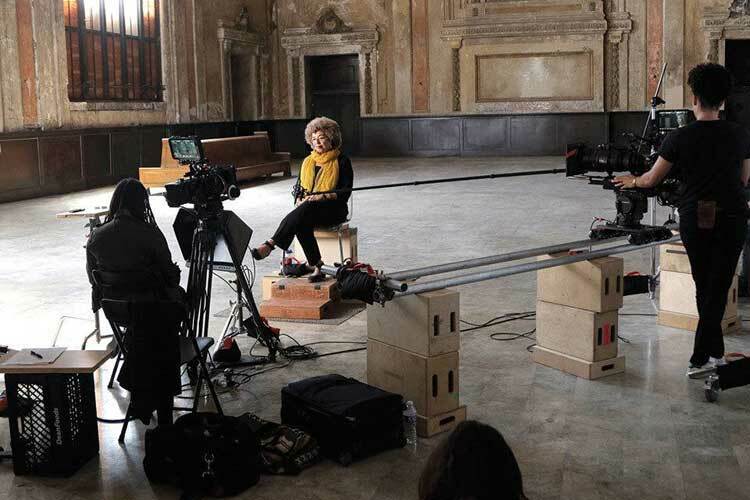 In the final segments, DuVernay connects the rise of mass incarceration with the murders of Trayvon Martin, Michael Brown, Philando Castille, and many others. Ferguson was indicative of the system that’s gone horribly awry. To quote Midnght Oil’s “Blot”, the presumption of innocence was buried again. Viewing a series of videos of young men being killed for no reason is hard to bear. On the other hand, it’s essential that more of us recognize the truth. When law enforcement makes a presumption of guilt with citizens, bad things happen. There are far too many effective speakers in 13th to list them all. One standout is activist and former professor Angela Davis, who successfully defended herself in federal court back in 1970. The archival footage of her comments from around that time is quite relevant today. Davis speaks from a stunning location, and that’s another plus for this documentary. DuVernay doesn’t forget the importance of visual style even when presenting straightforward interviews. This film moves smoothly and never feels like a dull history lesson. Another surprise is the logic we hear from Newt Gingrich, who has stumped for Trump. He’s either putting on a front in the movie or in his public life. Either scenario is a problem, and this conflict gives a perfect example of obstacles to change the system. A guy like Gingrich may talk about the issues and even understand them, but doing something is another matter. 13th inspires me to learn more and look for ways to make things better. Voting is the first step, but it shouldn’t be the last. I’ll close with a simple message: you need to see this film. 13th is currently streaming on Netflix. I do want to see this even though I have Netflix. I hope to see this before Election Day as I know one thing. I'm not voting for Trump nor Clinton. I can respect that choice in terms of the vote. Regardless, 13th is worth seeing for anyone because the issues are so universal and important.